If the amount of an essential mineral element such as potassium or calcium is adequate in the soil, the grass can obtain all that it requires from the soil, and fertilizer applications of that element will not be required. Soil nutrient analyses (soil tests) are conducted to determine if an element is required as fertilizer, or not, and if it is required, in what amounts. The MLSN guidelines provide the newest recommendations for what can be considered adequate. But there is more to look at than just the amount in the soil at any one time. The nutrient content in the soil is dynamic. 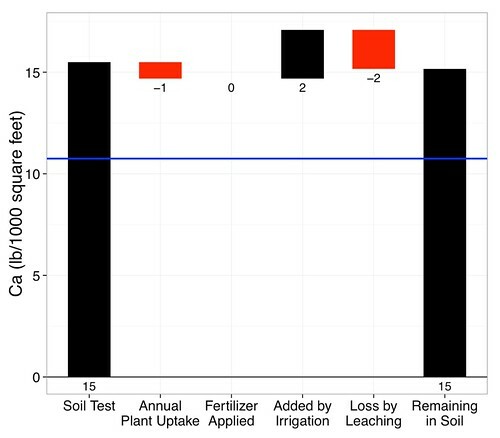 Waterfall charts are a quick way of looking at the inputs (starting amount in the soil, fertilizer applied, amount in irrigation water) and losses (plant uptake and harvest through clippings, leaching) to give an idea of the magnitude of each of these amounts. I previously made waterfall charts for two essential elements, potassium and calcium, and one for an element we wish to manage below a certain level in the soil, sodium. 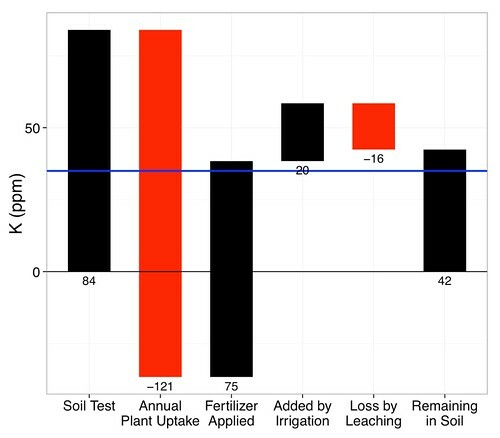 Those charts all used units of parts per million (ppm), which is what soil tests and irrigation water are reported as, but usually not what one thinks of when applying a fertilizer or harvesting grass clippings. I have made a new series of charts, with potassium and calcium both shown in three different units of measure: ppm, grams per square meter, and pounds per 1000 square feet. First, let's look at calcium. The horizontal blue line represents the MLSN guideline for that element. When the element is present in the soil above the MLSN guideline, the grass can obtain enough of that element from the soil, without supplemental fertilizer applications. This is based on estimates for Bangkok, where a bermudagrass green may produce about 900 grams of dried clippings per square meter each year, containing on average 0.45% calcium, and where 600 mm of irrigation may be applied each year, with a calcium content of 20 ppm. For this situation, the amount in the soil is above the MLSN guideline, and no calcium is required as fertilizer, because all of the plant requirements can be met by the large reservoir of available calcium in the soil. For potassium, it is a bit different. There is less in the soil, and the grass uses more, and these charts show that the plant uptake is more than the starting amount in the soil. Fertilizer, in this case, is required to keep potassium above the MLSN guideline. These charts for potassium are based on 900 grams of dried clippings per square meter per year, with a 2% potassium content, and 600 mm of irrigation with a potassium content of 5 ppm. These types of charts can be modified to show the mass balance for any element, because the starting amount and the annual inputs and losses of an element will be different for every location.